One of the most popular juicers on the market. Very robust body stove-enamelled in white. Tempered stainless steel cutting blades will not tarnish, rust or separate. Comes with a blank screen for use as a homogeniser or blender. Very easy to use and clean. Pulp is ejected from the machine. As more value is extracted from a vegetable, more pigments or color are also extracted. This is why Champion prepared juice is darker and richer in color when compared to that of a conventional centrifugal-type juicer. This is true whether it is carrot juice, mixed vegetable juice or straight chlorophyll juice such as parsley juice or turnip leaf juice. You can also see it in the Champion extracted pulp; it is pale in color. The Champion Juicer is the answer to every juicing problem. Because it operates on the mastication process, the Champion Juicer chews the fibers and breaks up the cells of vegetables and fruits. This gives you more fiber, enzymes, vitamins and trace minerals. This all results in the darker, richer color of the juice and a sweeter, richer more full-bodied flavor. Powered by a full 1/3-horsepower, heavy duty General Electric motor, the Champion Juicer is powerful, durable and built to last. All juicer parts are made from 100 percent FDA accepted nylon and stainless steel. The Champion Juicer's body is lined with a special stainless steel which is almost wear-free and will not pick up food odor. The Champion uses a masticating process. This is basically a slow rotating cutter, which effectively chews up the vegetable to separate the juice from the pulp. 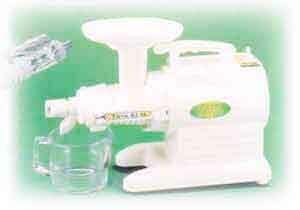 The Champion Juicer is an excellent heavy-duty machine producing high-nutrient content juice. It achieves a high juice yield, has the largest feeding chamber and is the easiest to clean of all our machines. It is certainly most suited to people whose time is at a premium or want to spend the least amount of time in the actual juicing procedure. 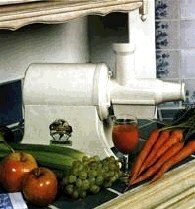 As a vegetable juicer it is second to none. The Champion also comes with a Grain Mill attachment for grinding coffee, flour and other grains. The main drawback of the Champion is that it won't juice wheatgrass. If you're not interested in wheatgrass then of course this isn't a problem. It's important to match the qualities of the juicer to what you intend to do with it. 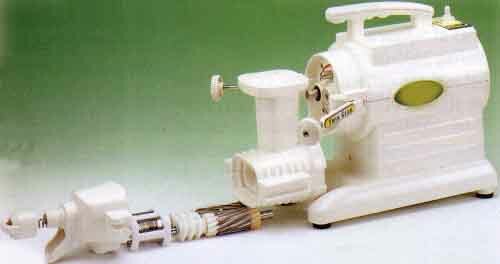 Green Power machines are reputably the world's best juice extractors and most efficient food processors. Using Exclusive Heavy Duty Twin Gear technology, superior to those of any competitor, Green Power machines are the best. No need to look elsewhere. Easy to use, simple clean up, Green Power Juice Extractors and Food Processors are award-winning machines of unsurpassed quality. The Green Star Juice Extractor and Food Processor uses the same Exclusive Heavy Duty Twin Gear technology with the same low 110 rpm, at a much more affordable price. Green Star GS-1000 has all the basic juicing and food processing equipments. Some accessories which are not frequently used have been excluded for an economical price. Accordingly, it too can process whole foods making favorites such as pie crust from almonds and dates, pates from nuts and vegetables, sauces from a vast array of combinations, baby foods, frozen fruit desserts, and more. The choice is yours. Longer-lasting juice with more nutrients - Patented twin gear technology extracts more minerals from the produce juiced. 1/4 HP Motor - Full 1/4 horsepower, 190W, 60 Hz, 120V motor with reduction gear equals about 4 horsepower of pure pressing power. Low RPM - Slow 110 rpm creates minimum heat build-up during juicing or food preparation. Homogenizing Blank - Homogenizing blank makes wonderful baby foods, nut butters, fruit sorbet and more. Two Screens - Two screens (fine and coarse) to juice vegetables, fruits, herbs and cereal grasses. Pulse Reverse Gear - Safely dislodges food blocking proper operation. Common high impact juicers and blenders destroy large numbers of life giving enzymes in the juice by subjecting them to heat and shock produced by metal cutting blades and high speed centrifugal rotation. With the Greenstar, maximum nutrients and enzymes are retained in the juice. 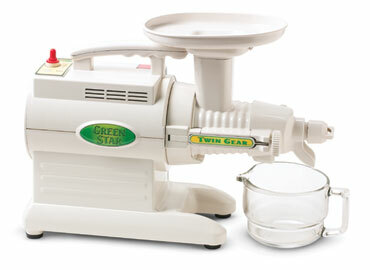 The Greenstar juice extractor minimizes the loss of nutrients through the unique triturating twin gear feature, an impeller press system with powerful, low, (110 RPM) turning speed. It generates virtually no heat, thoroughly crushing and pressing fruits and vegetables, instead of cutting and shredding them into small pieces. The result is more living food per glass of juice. Make chlorophyll-high juice from wheat grass, barley grass, alfalfa and other grasses. Extract juice from pine needles, therapeutic herbs, fibrous plants, pulpy fruits and leafy vegetables. The Greenstar does all of the above and a whole lot more! It's full complement of time and money saving practical accessories will allow you to make mochi (oriental rice cakes), baby food, and desserts including delicious frozen fruit sorbet. The Greenstar Juice Extractor is by far one of the most versatile juicers on the market today. If you are considering a juice therapy program or you find that your present juicer simply can't do what you need it to do, why not try Greenstar? You won't be disappointed. In addition to keeping more enzymes intact because of less heat and friction, the Greenstar also utilizes bioceramic and magnetic technology. This helps to add more positive ions and vitality to minerals in the juice. At the core of each of the twin gears is a series of magnets, each three-quarters of an inch long and alternated between positive and negative. When the two gears are placed side-by-side, the positive and negative magnets are also alternated between the gears, generating a positive charge. At the molecular level, this means the magnets are creating positive ions as the gears spin. Surrounding the inner core of magnets is a second level containing bioceramic particles and an outer layer of stainless steel. Bioceramic particles, produced by far-infrared technology, also emit positive ions. Magnets in the Greenstar work in conjunction with these bioceramic particles. The magnets recharge the bioceramic material and the bioceramic material recharges the magnets. Without this recharging, the effect of both the magnets and the bioceramic material each would eventually be diminished. As the gears are spinning, the magnets and the bioceramic material are each producing more positive ions than can be held in charge by either the magnets or bioceramic material, therefore many of these positive ions go into the juice. These additional positive ions add more vitality and longevity to the life of the minerals, reducing oxidation and keeping the juice fresher longer. The new patented Twin Gear Technology incorporates magnetic and far infra-red technology which enables juice made in the Greenstar to be stored in the refrigerator for up to 48 hours without losing its health building benefits. The Greenstar is designed for life. If an unusually hard substance accidentally enters the gears, the reverse rotation override immediately stops the motor before any damage occurs. Additionally, the Greenstar's precision balanced 1/4 horsepower motor with special reduction gears, reducing the speed to 110 RPM, generates very little noise or vibration compared with an ordinary juicer. Because of these outstanding features, we are confident that your Greenstar juice extractor will bring you a lifetime of trouble-free, soft as a whisper, noise free juicing. Impeller press system of twin gear enables continuous juicing. Easily disassembled for cleaning with the brush included in each box. Powerful triturating action of TWIN GEAR cuts and juices almost all vegetables including carrots, celery, leafy vegetables and wheat grass. The new TWIN GEAR system incorporates magnetic and bioceramic technologies enabling juices made in the Greenstar to be stored longer, without losing health building benefits. At the core of each gear is an inline series of magnets, totaling 2600 gauss, that assist in extracting more minerals from any produce or cereal grass that you juice. Surrounding the series of inline magnets is a proprietary bioceramic material that aids in stabilizing the water molecules in the juice. This means juice can be stored for a longer period of time. The patented Pocket Recess of the TWIN GEAR easily guides tough, fibrous vegetables and herbs into the juicing area between the two gears. There are three cutting points on the TWIN GEAR, set to cut stringy fibers into small pieces, preventing a machine jam, which often occurs with ordinary dual gear juicers. Availability: All Juicers In Stock! Delivery: Sent within 48 hours, with Next 24hour delivery. What methods of payment can we use?